The next step is to make sure that the preview ref is used when you make your queries. The following example checks to see if there is a preview cookie. If there is, then it will set the ref variable to the preview ref. If not, it will use the experiment ref (if there is one) and otherwise the normal master ref (default published content). That is all you need to do to gain the basic functionality of the Preview feature! 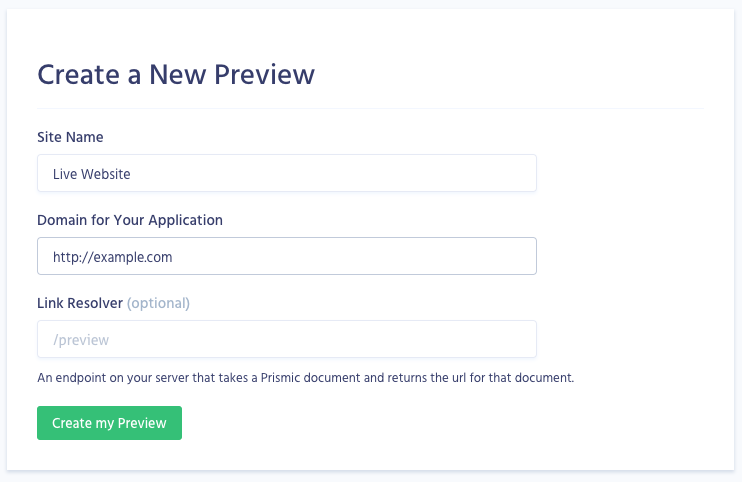 With the basic functionality of the Preview feature, when you click on the preview button, you will be taken to the homepage of your preview domain. From here you can navigate to the page you are trying to preview. Using the official Prismic starter project? If you are using the official Prismic Ruby on Rails starter project, then you should already have all the code in place you need for In-website previews. That's as much as you need to do! The example above uses a Link Resolver, link_resolver() , to determine the end url to redirect to. To learn more about how to set this up, check out our Link Resolving page.